This graph shared by political scientists Ryan Enos and Eitan Hersh on the Washington Post's The Monkey Cage Blog shows how most Democratic Party campaigns overestimate their candidate's standing among voters. 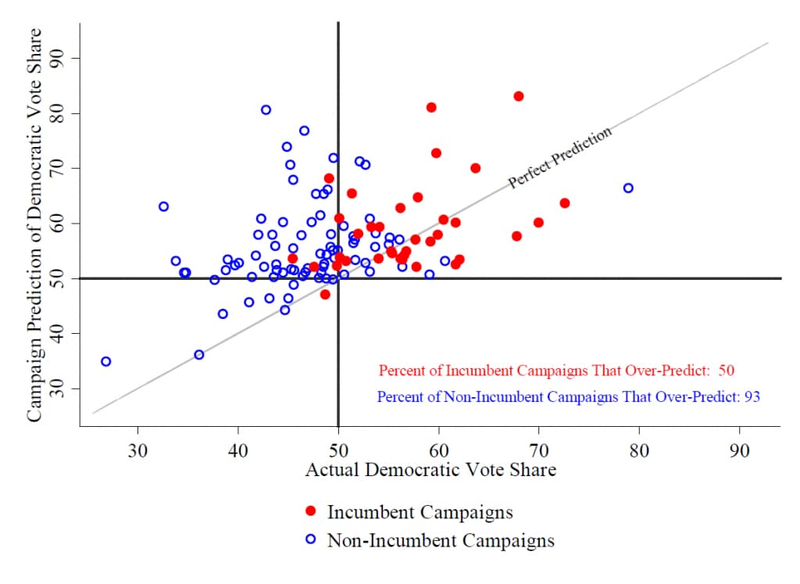 Notably, the campaigns studied mainly fall into the upper-right quadrant, which means that most campaigns predicted they would win but actually lost. This graph is from Enos & Hersh 2013: Fig. 2. First off … I just want to underscore the non-partisan (or para-partisan) nature of my discussions about contemporary politics. So far, I’ve been dealing pretty much with American politics, but hopefully, anthropological consideration of how emotions get folded into political decisions can really help us to think about something more general, albeit in a fresh way: the very political foundations of human sociality. My upcoming posts will be a series on Anthropology and Philosophy, will be a bit more academic, and will aim to bring the focus back to that of biocultural evolution. But recently, I’ve been especially concerned about providing a rarely offered anthropological perspective on the way that marked, dramatic American cultural narratives–which we tell ourselves, selectively listen to, or stage and act in, through the processes of ritualization and mythologization–move likely voters emotionally… so much so that they and the political apparatuses who court their votes can develop quite damaging addictions to the resulting “high,” the sense of stability and control we gain from telling myths and participating in rituals. Yet, if we aren’t careful and critical before we let ourselves get carried away, from the everyday into the emotionally overwhelming realm of myth and ritual, the narratives involved can blind us to how our resulting sense of control or stability actually comes from something else: resolving to build barriers and effectively exclude people from society we consider proper. And this unfortunate moral blindness itself can be strikingly shortsighted, while actually creating further disruption, despite the aim of achieving stability and control. My point is that the kind of moral blindness that ritual and myth create is also fundamentally human and, as such, wholly nonpartisan. Trying to recognize when we’re telling ourselves clever, yet dramatic and moving stories that are actually driving us emotionally is important. This is because we all do it. It’s not that some people are emotional and irrational, while others are simply able to maintain mental discipline and think clearly. It’s a basic part–as I will argue and illustrate in some of the coming posts–of how individual thought translates into action in human social life. This may be the most important reason why an anthropological perspective is valuable in considering contemporary politics. In accepting that emotional reactions to moving stories that overwhelm us and shape our resolve and actions, we can shift our focus toward understanding how the narratives affect us, what the emotional effects are, and what kinds of joint actions, shared identities, senses of social order, and social boundaries result from particular dramatic story-emotion-action feedback systems. Everybody wants to know the reason without even asking why. Oh, everybody wants to know the reason, all without even asking why. You know, everybody wants to go to heaven, but nobody wants to die. Unfortunately, song as a ritualized departure from everyday life can have an addictive effect, too; as we express our worries, we shrug them off. And returning to the everyday challenges, we try to keep things going … unfortunately–in this particular instance–belying the fact that we are riding a cultural bubble that may unexpectedly pop into personal or social disruption. Yet, sometimes, the emotional experience of ritual and myth can transform us when we return to the everyday, giving us the resolve to seek and work for strategies for change. Enos, R. & Hersh, E. (2013). Elite Perceptions of Electoral Closeness: Fear in the Face of Uncertainty or Overconfidence of True Believers. 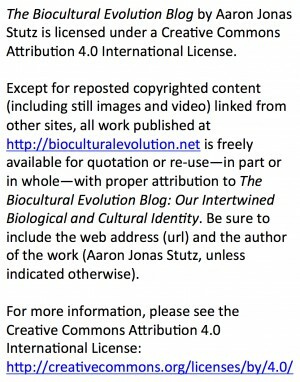 Working Paper accessed on 2013-10-13 from https://static.squarespace.com/static/521abb79e4b0ee5879077f61/t/525411d6e4b055e5383a2645/1381241302210/EnosHersh.pdf.